As another year comes to a close, and Christmas rolls by, with wrapping paper still on the floor, and ham and turkey still stuffing our stomachs, the night of Christmas Day brings as much joy to the hearts of breaks fans as Christmas Eve does to kids. 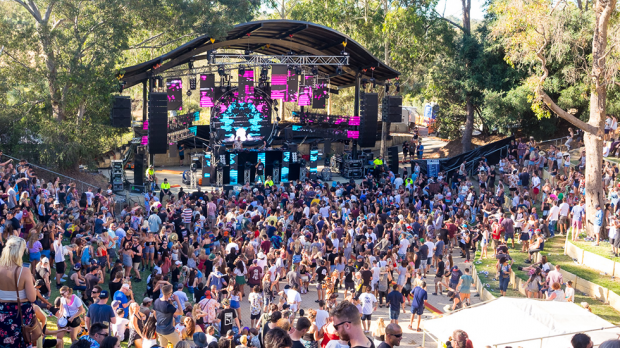 The excitement builds as they prepare to make the pilgrimage out to the Swan Valley for Perth’s favourite and longest running dance festival, now in its 17th year. Breakfest is a Perth institution, and the organisers Boomtick have long held the recipe for a great day. 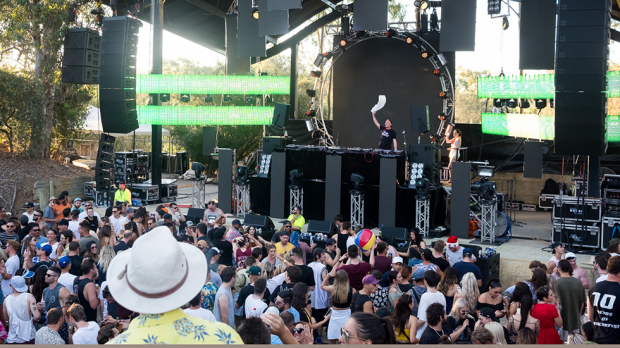 A glorious summer arvo and evening, the magnificent grounds of Belvoir Amphitheatre, a good crowd of dance music lovers and an always solid and varied lineup that features a mix of breaks, drum ‘n’ bass, hip hop, as well as dubstep and trap. Mix together in a giant bowl, sprinkle on some beats, heat up and bam, you got yourself a damn fine party. 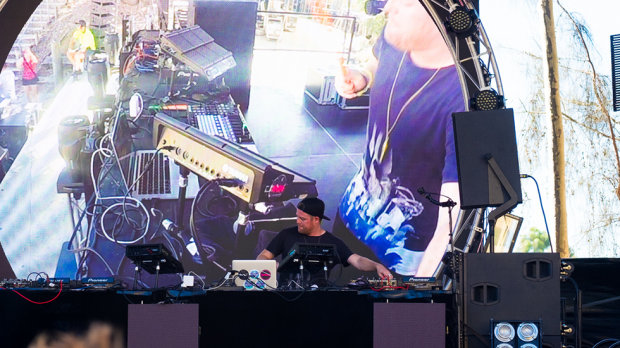 There are always some recurring names and Breakfest alumni that make up the line up, and this year was no exception with Perth favourites Krafty Kuts and Z-Trip playing. Though to keep it interesting they were both playing unique, exclusive collaborations. The line up saw a host of local and overseas talent spread across two main stages – one in the majestic amphitheatre and the other in the Hiline Hangar tent up the top. This year also saw the debut of a new stage, the Boom Dome, an inspired addition, the big domed inflatable tent had a queue most of the day, punters waiting to get inside the dark confines and spin out to the huge bass sounds of some local selectors set to awesome visuals projected on the domed roof. It was a real sensory overload. Unfortunately later on the Dome sprung a leak and was left deflated, as were the punters, ceasing festivities for that stage. Hopefully next year the design of the Dome will be tweaked and it will make a comeback, as this was a very cool idea providing a smaller dark space to really get your rave on. There were many great sets throughout the day that had music lovers running back and forth up and down the massive stairs to check out both stages. Local legends, DJ and production duo Black & Blunt really got the party started as only locals can. The Ambar regulars have done this many times before and knew exactly what the Perth crowd wanted. The infectious enthusiasm and chemistry between the two good mates always comes through, and they worked their way through a tight mix of fat and funky tunes, awesome grinding breaks, with satisfyingly good drops. It was a bit of a special set too with Micah Black recently announcing he’ll be parting ways with Boomtick, after a very long association that helped establish the institution that is Ambar, as well as this very festival. No doubt we’ll still be seeing and hearing him around town, but his contribution to the local scene since becoming a regular at Ambar 16 years ago is massive. Opiuo played a really nice set, perfect for around 4pm. The Kiwi producer has moved from strength to strength in recent years, fresh from a US tour, he brought some smooth, jacking beats and future bass sounds, even adding a live element, hitting some pads with drum sticks. 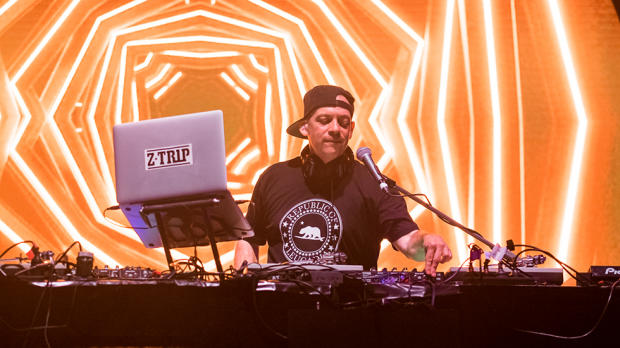 Another big drawcard and highlight of the day, was the pairing of party breaks maestro and turntablist extraordinaire Krafty Kuts with Jurassic 5 rapper and all round legend Chali 2na. They dynamic duo drew a big, curious crowd, and they proved to be a great combination. A whole lot of fun, they really got the crowd involved, with Krafty Kuts serving up phat beats, while everyone’s favourite J5 member, the towering 2na, worked the crowd, spitting rhymes in his unmistakable baritone with that smooth flow. A rare set from Perth’s own worldbeating Zeke Beats enticed some away from the pit, but the main stage was heaving. As the Breakfest crew unleashed a flurry of beachballs on the crowd, Krafty and Chali busted out some on the fly remixes, with Chali rapping some of his own J5 verses like What’s Golden over different beats that Krafty cut up, along with several classic tunes, such as the Wu-Tang Clan’s C.R.E.A.M. with Chali putting his own spin on it. It was a truly epic set in the classic Breakfest style from a couple consummate professionals, and really got the party started in the pit. After Chali left the stage, Krafty stayed on to put on a bit of a show with one of his inimitable mashups, blending The Fugees’ Ready Or Not into some heavy dubstep. This led quite well into Adam F’s set. A veteran of the scene, old school drum ‘n’ bass legend, and co-founder of the mighty Breakbeat Kaos label, Adam F has evolved his style over the years into a much more upfront heavy dubstep, hip hop mashup. Very different to the man that produced the classic jazzy 1997 drum ‘n’ bass album Circles. Now he’s getting on the mic and hyping up the crowd, and unloading with a huge bass assault of Dead Prez’ Hip Hop mashed up with Wu-Tang Clan’s Bring The Ruckus. Another Perth fave, the unsubtlely named Canadian DJ and producer Stickybuds, has a penchant for big juicey, bouncy beats, with a bit of dub and ragga flair. He ripped things up in the hangar as the light began to fade, dropping M.O.P’s Ante Up to get heads nodding. Back in the amphitheatre, the crowd was growing for arrival of the other big drawcard and exclusive, The A – Z show featuring A. Skillz vs Z-Trip, respectively of the UK and US, and truly two of the finest party-rocking, cut ‘n’ scratch, mashup turntablists around. It was a real treat, and a world-first Breakfest exclusive to have these two mix masters, cutting things up alongside each other. It was a schooling, as classic tracks flew by, in and out of the mix at breakneck pace. The Police’s Roxanne was brilliantly blended with Dr Dre’s Forgot About Dre. Grandmaster Flash rubbed shoulders with Nirvana and the obligatory AC/DC was dropped. Some clever, fun, little custom sequences they’d put together were the cream on top, as they blended Scribe’s Not Many into Eminem’s My Name Is that had been edited to introduce the two DJs. 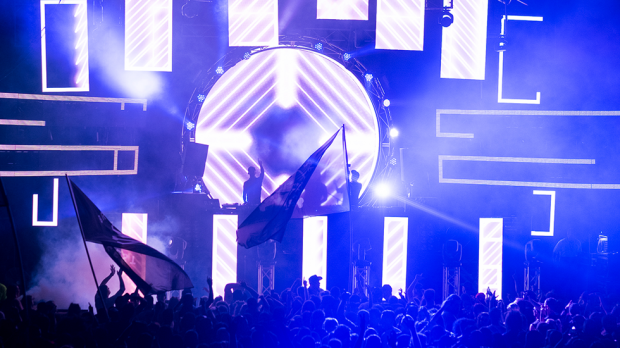 Matrix & Futurebound were another heavy hitting combo to take the main stage. With a hard act to follow, they kept the party going with a big set of pure d’n’b, some epic rerubs of classic tunes, indulging us in a specially curated mashup, complete with some Pendulum and their own big tracks like Control and MC Xsessiv on the mic. Their large show was enhanced by the massive, explosive light show. Nothing really beats a fully packed, going off Belvoir. The boys did a great job to keep the energy of the crowd. It was a pity the final act wasn’t better chosen. Boombox Cartel came on and totally ruined the vibe. 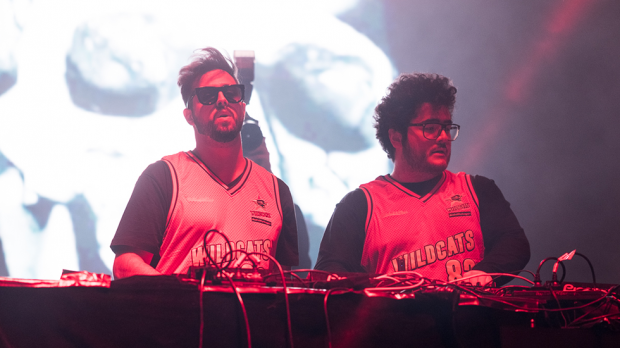 With a bit of a tone def performance, the Mexican Mad Decent roster artists went full trap party on us, slowing down the beats and losing the flow with the lurching, stop/start nature of the tunes failing to connect with the crowd, and cutting off the free flowing dancing that had seen the big bowl heaving moments ago. With one of them jumping on the decks and shouting at us, and even allegedly throwing a boombox into the crowd and injuring an audience member, it was all a bit aggressive and jerky. These trap lords might have a new following among some of the younger crowd, but were not worthy to headline the main stage. The tunes were just not of the right vibe for the end of the night, and the amphitheatre was looking a lot more empty than usual at this point of the night. 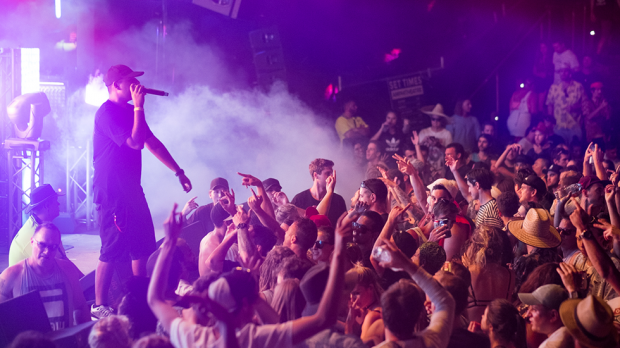 Many who just wanted a good boogie started to drift off upstairs to the Hangar, where Josh White of UK drum ‘n’ bass outfit Hybrid Minds was in attendance to wrap things up for those who wanted to dance. 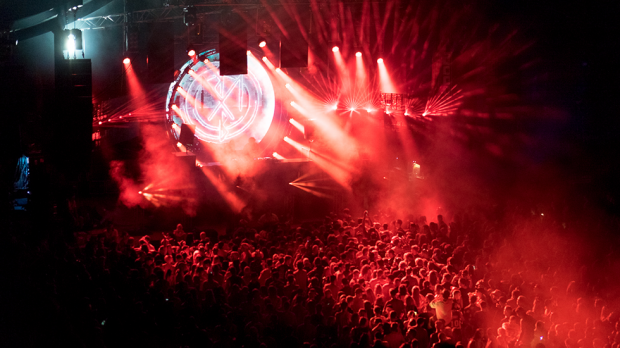 In fact, it’s a shame Hybrid Minds weren’t swapped to finish off on the main stage, as the lush, liquid beats and joyous melodic strains of their own classic tracks like Touch were a real euphoric hands in the air moment that had everyone jumping. Overall, another great Breakfest – perhaps lacking in the breaks department somewhat, but a celebration of the ever evolving broken beats and bass music of all forms. 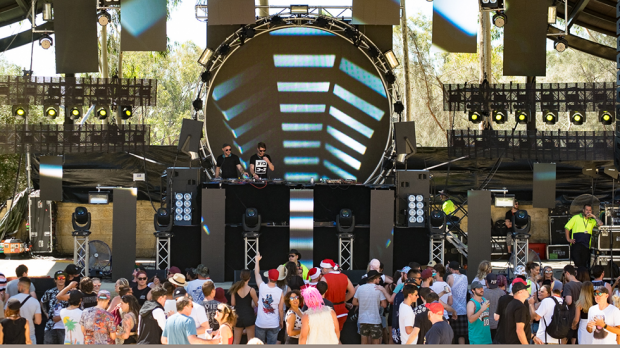 There’s a reason it’s been running for so many years, with a wicked vibe unmatched by any festival, a well balanced lineup, good crowd, manageable size and the best venue in Perth – Boxing Day is always a great day to be at Belvoir.